Click on the photos to see enlarged sizes. In both the first and second photos, the women are wearing the sari in the South Indian way - pallu falling over the back. These photos demonstrate how the pleated part on the chest should not fall from under the right armpit - the top pleat should be pinned to the blouse right above the breast by the armpit. The second photo shows how the fabric can ride up on the left side. I used to curtail this problem by pinning the underneath pleat to the sari blouse. The lady in the right most photo is wearing the sari in the North Indian way. This method is a difficult wrap compared to South Indian, and also more difficult to wear properly. This wrap is considered more 'revealing' in south since it shows more of the woman's back. However, it is also harder to keep the fabric covering the chest in this method, also. I was told to pin the fabric from underneath to the choli above the breast on the left side. 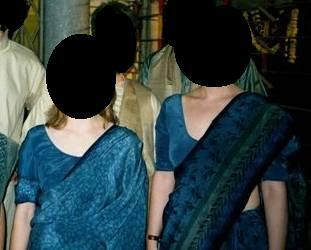 You can see me wearing sari in the North Indian way here! Another tidbit- learning to walk in a sari properly makes a woman very graceful. It is not easy. One must make sure the pleats stay in the skirt- which can be easily done by pinning them to the underskirt. Hence, I keep many pins for saris. One sari may need up to six pins to make sure everything stays in it's proper place! While walking up stairs in a sari, do not lift the sari and underskirt together. It is not considered proper to show your legs, so you should lift only the pleats of the front of the sari while walking up stairs or in hard terrain. Also, if wearing in the south Indian way, you can keep the pallu from attaching onto things (or getting stuck in the car doors) by pulling it to the front and tucking or pinning it to the left side. Some may also wear the pallu over their head to protect them from the sun. This page has been visited times since it's inception in April 2002.